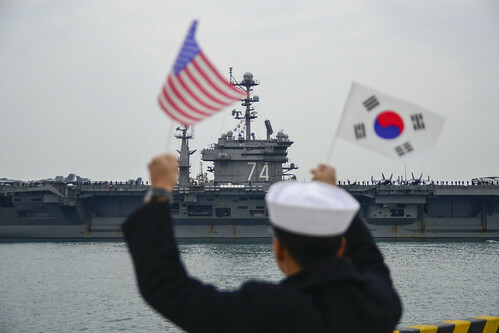 BUSAN, South Korea - Thee John C. Stennis Strike Group (JCSSG), the centerpiece of the U.S. Navy’s Great Green Fleet (GGF) initiative, arrived in the Republic of Korea (ROK) for a scheduled port visit March 13. USS John C. Stennis (CVN 74) and the guided-missile destroyers USS Stockdale (DDG 106) and USS Chung-Hoon (DDG 93) moored in Busan. The guided-missile cruiser USS Mobile Bay (CG 53) settled in Mokpo and the guided-missile destroyer USS William P. Lawrence (DDG 110) is in Donghae. Local children welcomed the strike group with a ceremonial gift exchange in Busan, followed by a press conference with Commander, John C. Stennis Strike Group Rear Adm. Ron Boxall and Commander, Naval Forces Korea Rear Adm. Bill Byrne. Stennis will host guided tours for more than 1,200 locals while in port to enhance partnerships, develop goodwill and create friendships in the area. Coordination for this port visit has been in the works for a long time, highlighting the close relationship enjoyed by the U.S. and ROK navies. Korea is a major fuel hub for U.S. Navy vessels in 7th Fleet area of operations. JCSSG has spent the first two months of its deployment using an alternative fuel blend consisting of 10 percent biofuel manufactured from animal fat mixed with standard petroleum-based fuel. The ships are also using operational procedures and energy conservation measures to increase capability and adaptability. “By transforming energy use and awareness, we become a more flexible fighting force— whether in the waters around Korea or in the waters we sail around the globe,” said Boxall. During their time in Korea, JCSSG Sailors have the opportunity to explore the region, participate in community service events, and morale, welfare and recreation (MWR) tours. Whatever they decide to do, Sailors will have the chance to learn more about the culture and practices of one of the U.S.’ greatest allies in the Indo-Asia-Pacific. While some Sailors are excited for exploring the nearby areas, other Sailors are excited for the native cuisine. JCSSG will participate with the ROK Navy in exercise Foal Eagle, an annual training exercise that incorporates scenarios such as gunnery exercises, communication drills, dynamic ship maneuvers, logistical rehearsals, salvage training and liaison officer exchanges between the two navies. The strike group is comprised of Stennis with Carrier Air Wing (CVW) 9 and Destroyer Squadron (DESRON) 21 embarked Chung-Hoon, Stockdale, William P. Lawrence, and Mobile Bay. CVW-9 consists of Helicopter Maritime Strike Squadron (HSM) 71, Helicopter Sea Combat Squadron (HSC) 14, Airborne Early Warning Squadron (VAW) 112, Electronic Attack Squadron (VAQ) 133 and Strike Fighter Squadrons (VFA) 151, 97, 41, 14. Providing a ready force supporting security and stability in the Indo-Asia-Pacific, Stennis is operating as part of the Great Green Fleet on a regularly scheduled 7th Fleet deployment.